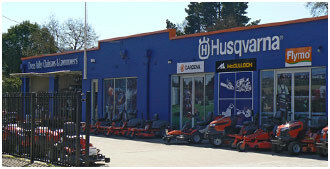 Valid 01/09/17 – 31/12/17, from participating Husqvarna authorised servicing dealers, while stocks last. Efficient hand held blower that combines high blowing power with user friendliness. Well balanced and easy to manouevre thanks to the in-line air out let. Easy to start with Smart Start© technology. Delivered with flat and round nozzle. Vac kit included. The Husqvarna 530BT is a unique lightweight commercial back pack blower in a class of its own. It combines very low weight and ease of use with impressive performance. Features include a new X-Torq© engine and a harness and controls that are ergonomically designed for high capacity and ease of use. Husqvarna 570BTS is a powerful commercial back pack blower designed for demanding tasks. Large air flow and high air speed are provided by an efficient fan design together with the powerful X-Torq© engine. Commercial grade air filter gives long operating time and trouble free use. The harness has wide shoulder straps.